I'm back! It was a wonderful holiday season. I loved having the kids home. And we spent time with family and friends, which is really what life is about, isn't it? I've already been purging all the things in the new year. I'm a purger by nature, but something about the turn of the new year makes me go into overdrive with getting rid of things! Sometimes, because well, life, I don't get things done at the pace I would like, but I'm learning to accept that and to take things one day at a time! Now, onto my front porch! 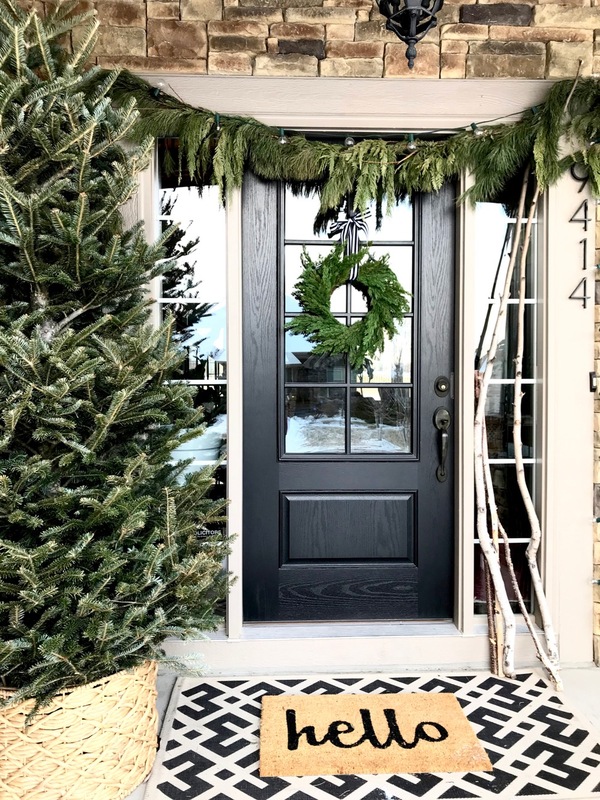 This time of year is so hard for making a home look welcoming from the street! The lack of flowers makes an entry difficult to work with. In an effort to keep things simple while still looking like people live here, I stuck with greens and black/white. You can't fail with this combo! 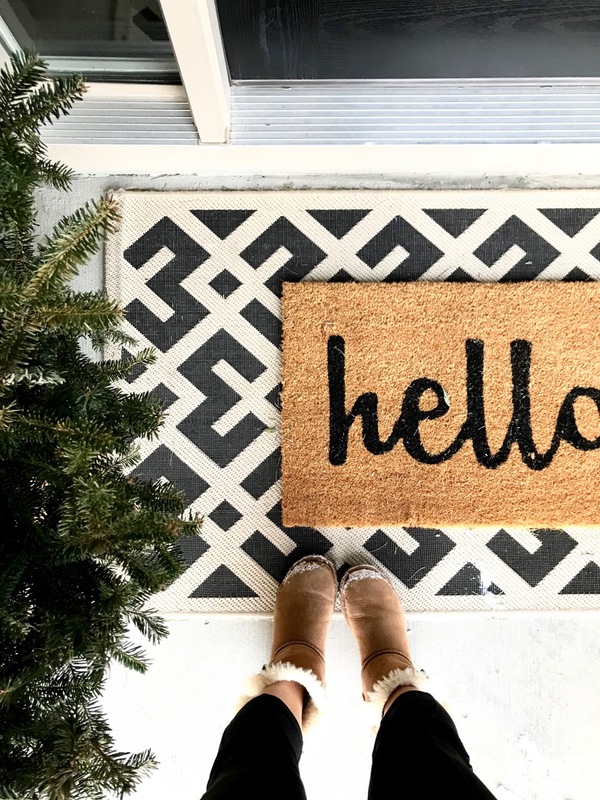 Layering rugs at the front door is cozy and intentional. And the message mat is inviting and quirky and fun. Yes, that is a Christmas tree on my front porch! What??? I'm not sure if this is crazy or genius to recycle the tree and get more use out of it for winter, but I'm kind of loving it. Our real Frasier fir tree this year was so healthy and beautiful (my favorite tree in all my years) that I couldn't stand to throw it out quite yet. I left it right in the basket it was in on the inside of our home. We have a covered porch, so even when it snows/rains, it doesn't really hit the porch. I thought the basket would be safe outside. And because of freezing temps, I'm not watering it. I'm just riding it out as long as I can. It still looks (and smells) great! Amazing! Post-holiday, a friend tipped me off to a Magnolia Market sale. 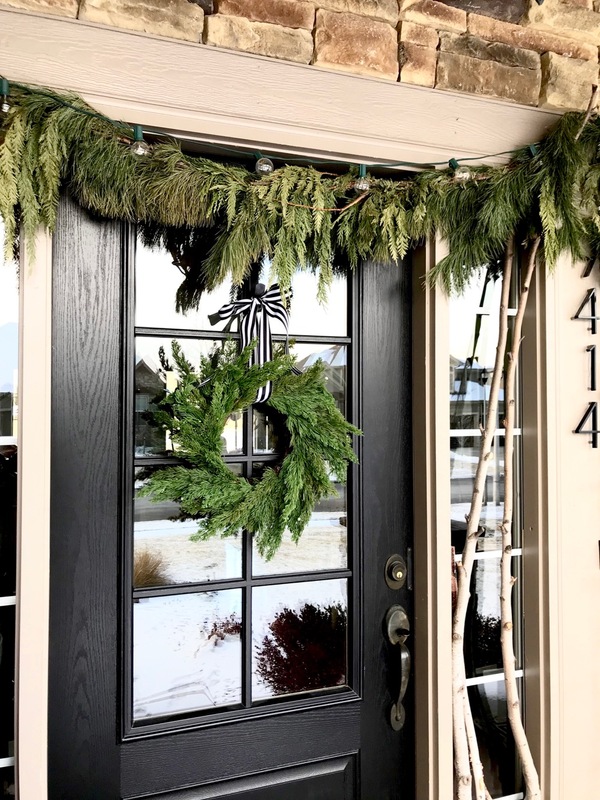 I was able to purchase two small faux fir wreaths for cheap! 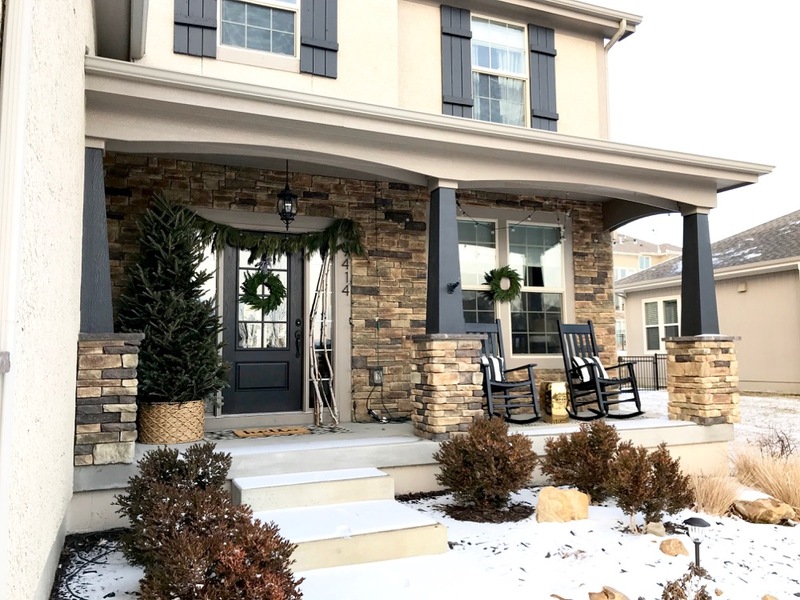 They are so well made and simple and add just a touch of winter to a porch. Removing all red from my porch allows this to go from Christmas to "winter" easily. 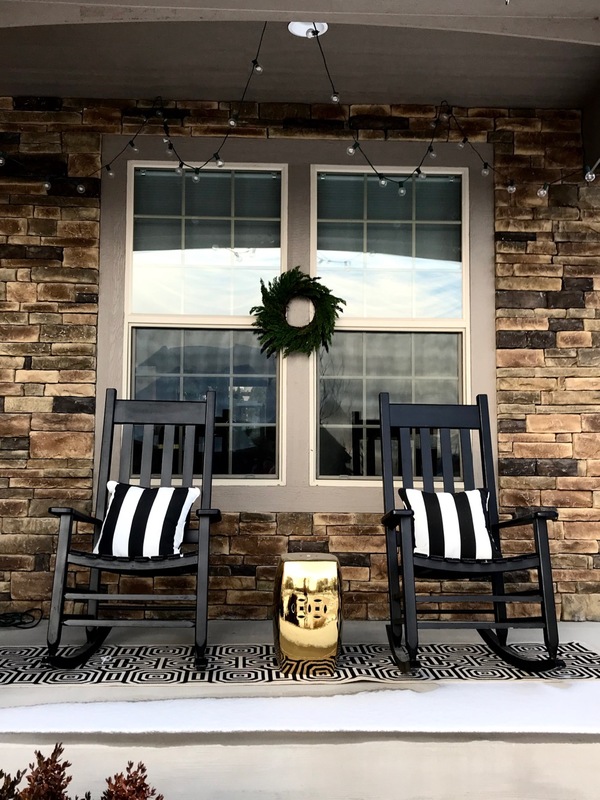 I use these black/whtie striped pillows on my rockers all year long. They are so versatile! The gold garden stool adds a touch of brightness to the otherwise neutral porch. Birch stems scream winter to me. They are also so versatile. These are actually stems cut from a real tree that was dying in our front yard 🙈, but home and garden stores sell these. Your porch looks great. 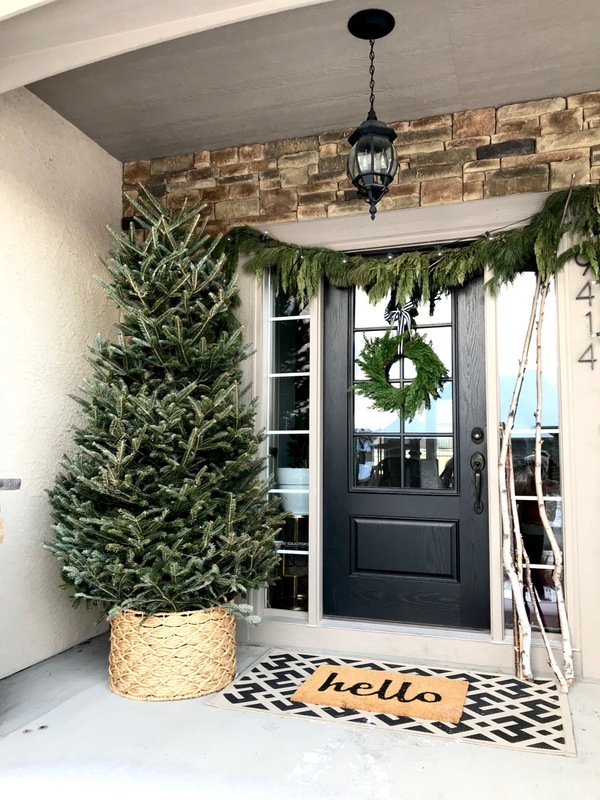 I love the idea of leaving evergreens up after Christmas. I always cut Magnolia branches and Leland Cypress boughs which I "plant" in the urns on either side of my front door for the holidays. And with no care, they last from the beginning of December to the end of January. Thanks for sharing all your lovely greenery! Your porch is always just perfect! The black and white is visible from the street, looks welcoming, and it's always inviting. Our door is black too...I just love it! That does look beautiful! 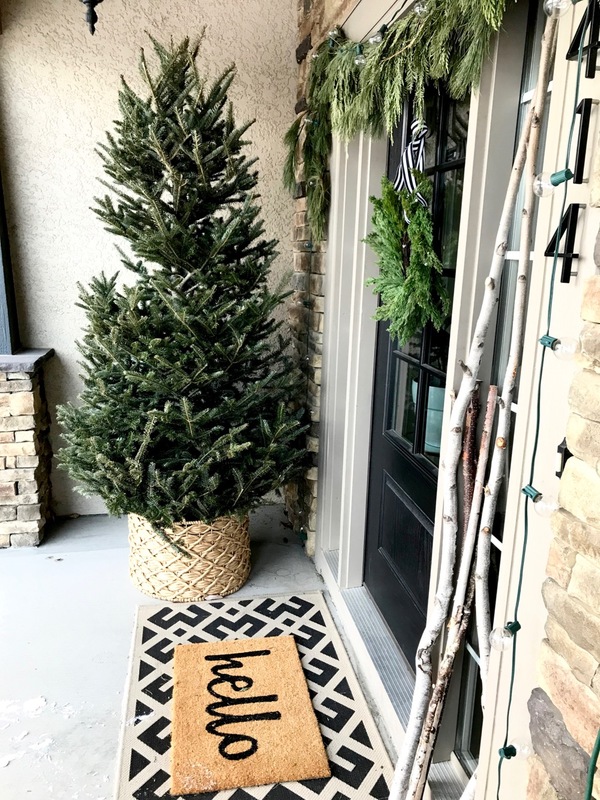 Our real trees are always needless and bare by the time we drag them out the door (so much so that we switched to fake trees several years ago).